Coupon code has expiry date. The coupon cannot be used at our eBay or our amazon store. Points can be used for next time of your purchasing our items. 1 year from the date of the shopping. Points will expire 1 year from the date of the shopping. After registration, check 「My Page」and Check Current points and Expiry date of the points. Points cannot be changed to money. 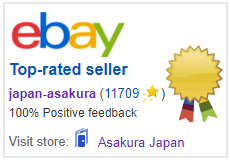 Points cannot be used at our eBay or our amazon store.